The opioid epidemic statistics showed that the fatal overdoses for 2016 totaled over 64,000 in America. The leading cause of overdoses is due to opioids such as heroin, fentanyl and other synthetic opioids. With the opioid overdose death rates continuing to rise each year, many people are trying to find a solution to the opioid crisis problem. Research and evidence shows how effective many forms of treatment, especially the approved medications for addiction treatment, are for treating the disease, yet many people do not find help for their problem. Stigma is still attached to both the use of drugs and addiction treatment, impeding the efforts of the government bodies and agencies that are trying to help those in need. The stigma that is still present is affecting the opioid crisis is several ways. Even though addiction is a mental disease just like PTSD, it does not receive the same recognition as other mental disorders. A person with an anxiety disorder would not be treated poorly just because they suffer from a disease that is out of their control. Yet a large portion of people still believe that addiction is not a disease but rather the consequences of poor decisions and everything that the person experiences due to their disease is deserved. The prescription opioid abuse problems and responses to the matter are far-reaching. Not only is it difficult for the addict to find help when their road to recovery has stigma attached, but government bodies are making changes based on the same stigma. This results in life-saving programs being removed just because some of the people in charge of implementing new programs in the government are against it. An example of the prescription opioid abuse problems and responses associated with stigma can be seen in the needle exchange programs. These programs provide a safe place for addicts to use their drugs offering clean needles and facilities, information on treatment and addiction as well as staff who are prepared to handle medical emergencies. Needle exchange is backed by the World Health Organization, the CDC and by Johns Hopkins Research yet Lawrence County officials decided to end their program. Their reason given was because of morals and the Bible. However, as a direct result of their beliefs, people will die. Opioid replacement therapy is designed to act as an alternative to the harsh abused opioids. Since the addiction that forms can sometimes be near impossible to just stop, opioid replacement therapy gives the person a safe amount of the substance in a way that cannot be abused helping to prevent the various negative outcomes of addiction such as the destruction is causes in their life and ultimately helping to prevent further fatal overdose in the opioid crisis. The medication is so successful that it is considered to be the gold standard in the treatment of opioid dependence and highly recommended by NIDA, the CDC and the World Health Organization. It could help the opioid epidemic statistics because it has been proven to reduce mortality rates by more than half. 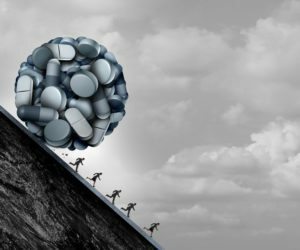 The opioid epidemic is filled with stories such as the New York case in 2013 where a judge refused to allow a person to continue with their methadone replacement treatment only to find the man dead just a few months later from overdose.